Choi Eunhwa (Choi): The project was conducted in an atypical manner. Once the architect found the site and finished the design, the client was selected. Gianni Botsford (Botsford): As architects we often initiate projects, either by identifying sites and opportunities and then introducing them to our clients, or by developing and funding them ourselves. In this project I worked with a contractor and we purchased the site together, deciding to develop the design without a client and selling it once we had received all the required permissions. Choi: What made you attend to this area, and this site, when it is neither on the roadside nor easy to find, enclosed as it is by buildings? I would like to know more about the potential and the unique charm of the site. I would like to know about the regulations controlling the site, such as restrictions on the building height and size. Botsford: I live in an apartment next door that looks down on the site, otherwise I never would have known about the site. I watched over it for years as it had a simple bungalow on the site that was very overlooked and overshadowed by the neighbouring buildings, and I always imagined designing a very different house and a unique garden that would respond in a very different way to the local context. The rules in the UK are complex but at the same time there are no rules—you have to negotiate your idea with the planners. In this case, they encouraged us to design something positive for the conservation area it sits within, which is how the concept of a pavilion in a garden emerged. Choi: It seems that housing projects rarely take basement spaces into consideration. You could have built a three or four-story building, like those on neighbouring lots but you did not. Why did you design the building to be one story above ground and two levels underground? Botsford: It would not have been possible to build higher than we have—we had to ensure that we did not affect the sunlight, daylight, or established views of the neighbours. So we had no choice but to go down, as it is a site of such small, tight parameters in a conservation area in London. Choi: The building seems to be simpler than typical houses in terms of its function and plan. Did the client want to design it as a second home? Botsford: The house was designed for a bachelor, living alone but with enough room to be able to host friends—so there is lots of living space and, minimal space for sleeping. 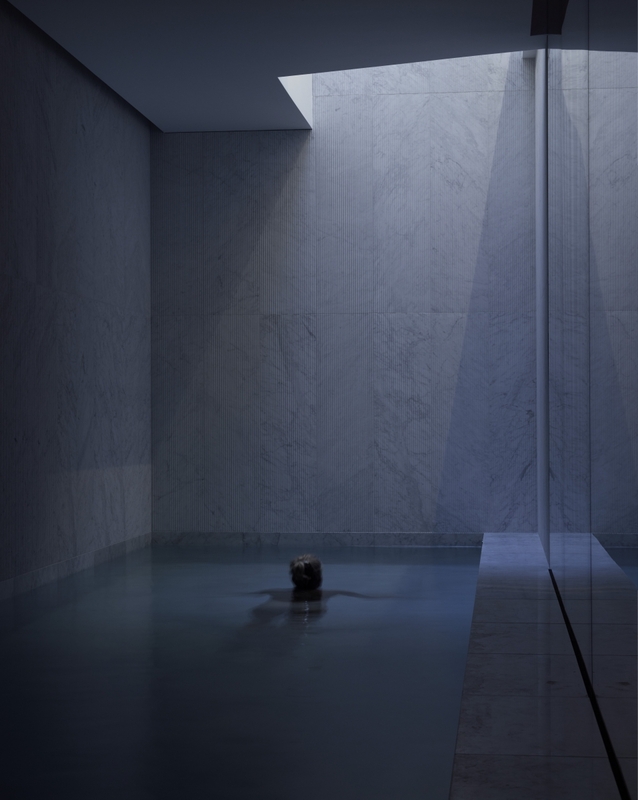 At the same time there are many different atmospheres in the house, which range from open and expansive to dark and intimate, so the house doesn’t feel ‘simple’ in that way. Choi: You may have experienced a lot of things while carrying out this project over a period of 12 years. What was the most difficult aspect? Botsford: The two storey basement is very complex as it is so close to many other buildings, but we also found out early on that there was a very large water pipe (the Thames Water Ring Main) 40m below ground. The water company was not happy with the idea of building a two storey basement to sit above this pipe, and tried to halt the project. After a lot of negotiation and structural calculation, it was possible to resolve this issue. However, finding the right partners to build the roof was more challenging, and the original company with whom we developed the design went into liquidation during the prototyping process. We found a new company in Germany called Zueblin Timber, who were specialists in glulam beam fabrication, and they were able to take over the complex fabrication process. Each glulam beam curves in three different directions and were all built from our digital model. 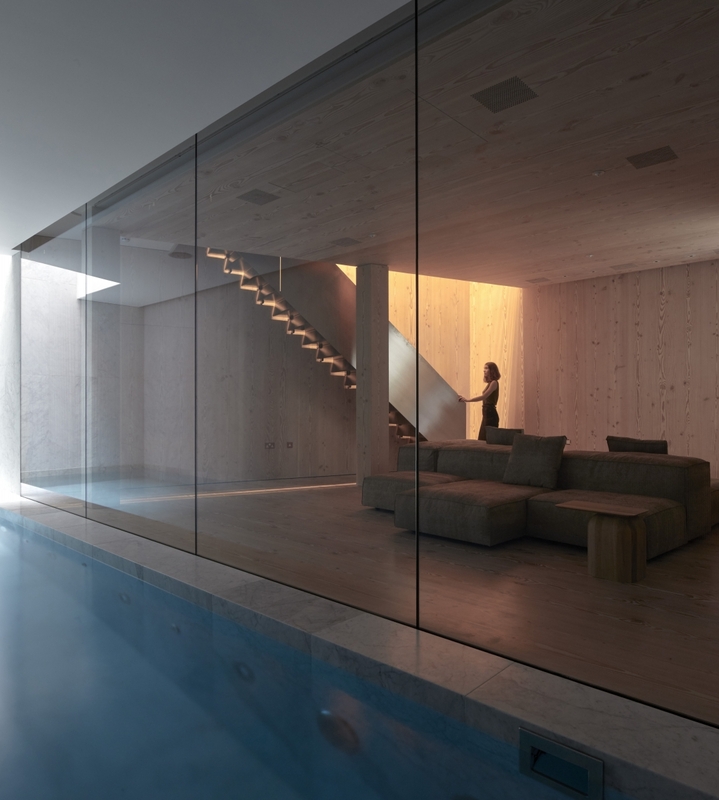 Choi: While the ground floor, with its living room and kitchen, seems bright and lively, lit by the skylight, the basement, with other functions such as bedrooms and a swimming pool, appears dark and calm. The ground floor contrasts sharply with the basement level. What kind of experience did you hope to advance in your design? Botsford: The differences are subtle as each floor reduces light levels proportionally, floor by floor. What the essential was to maintain a connection to the outside and the time of day, even when 8m underground on the lowest floor. Choi: What factors did you consider when determining the position, size and shape of the roof and skylight? Botsford: Once we had built a three dimensional map of the available light, we decided that the house should exist in the shadow of the surrounding building and face the main volumes of light on each side, as well as extending upwards to an optimally located skylight. Once you join all of these factors together, a final form emerged that managed to avoid intruding upon the light or views of the neighbours. Choi: Why did you choose copper as roofing material? It can reflect light and I wonder whether it causes residents of the building and adjacent neighbors any inconvenience? 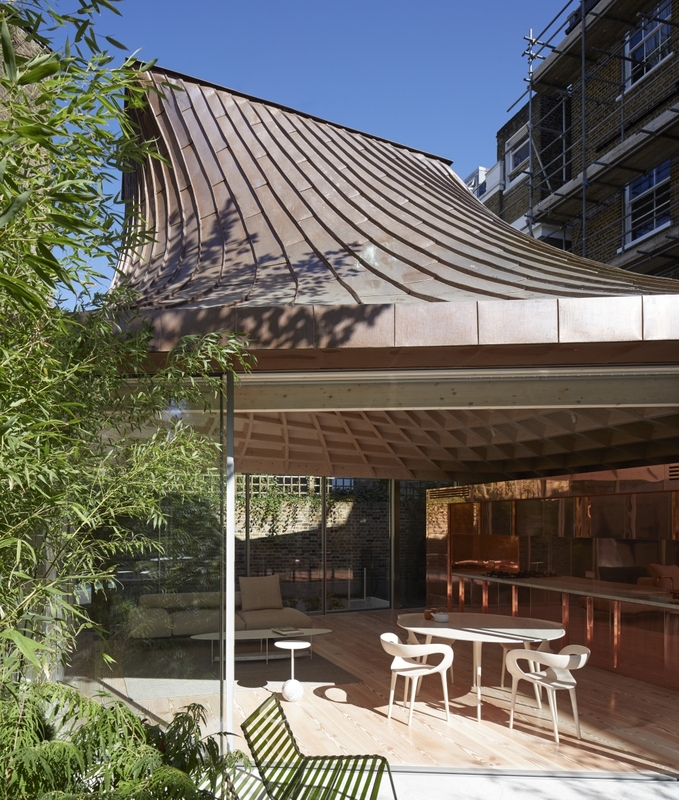 Botsford: Copper is both recyclable and long lasting, and once exposed to the elements it dulls considerably. It is a year since the copper roof has been installed and it is no longer reflective. We are told that it will eventually go green, but not for another fifty years! Gianni Botsford was born in Venice and originally studied Interior Design at Kingston University and worked for a number of practices in London. 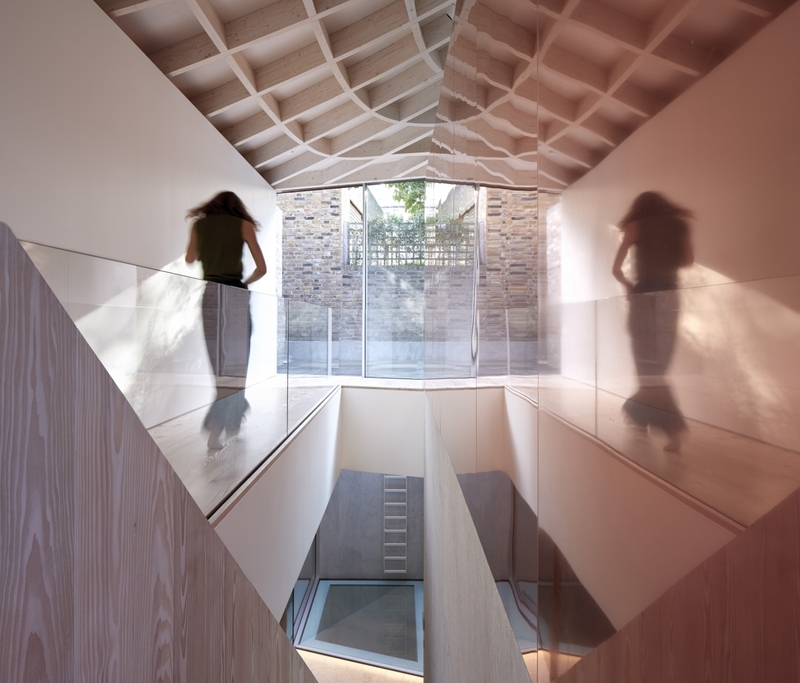 He completed his education at the Architectural Association in London before setting up Gianni Botsford Architects in 1996. He has taught at the AA and London Metropolitan University. He is currently a member of the RIBA Awards Group and sits on the Royal Borough of Kensington and Chelsea Architecture Appraisal Panel.